Here you go! Part 2 of the 5 part series, What Africa needs: Increased Inter- Africa trade. According to Reuters Africa, it costs South African grocer, Shoprite $20,000 a week to secure import permits to distribute goods in one country. As if that isn’t enough, in order to send one of its trucks across the border to neighboring Zambia, 1600 additional documents are required. An excessive amount of border check points are yet another problem. To transport goods from Nigeria to neighboring Ghana, you have to go through about 5 border checks. Ghanaian President, John Dramani Mahama admits that he is aware of the problem and states that Ghana is working to reduce the number of border posts to just one. In my humble opinion, zero would be better but you have to start somewhere right? The legal and illegal payments made at these borders are all costs that are passed on to consumers in order for the traders to make a profit. At one checkpoint in Mali, border agents extort as much as $4,000 every day. In addition to the aforementioned high costs of trade, unclear policies are another hindrance. Seeds from Kenya can be held indefinitely at an Ethiopian border because they don’t meet Ethiopia’s standards. Tanzania may ship corn to Kenya only to find out there is now a ban on the importation of corn. The issue of infrastructure also needs to be addressed. 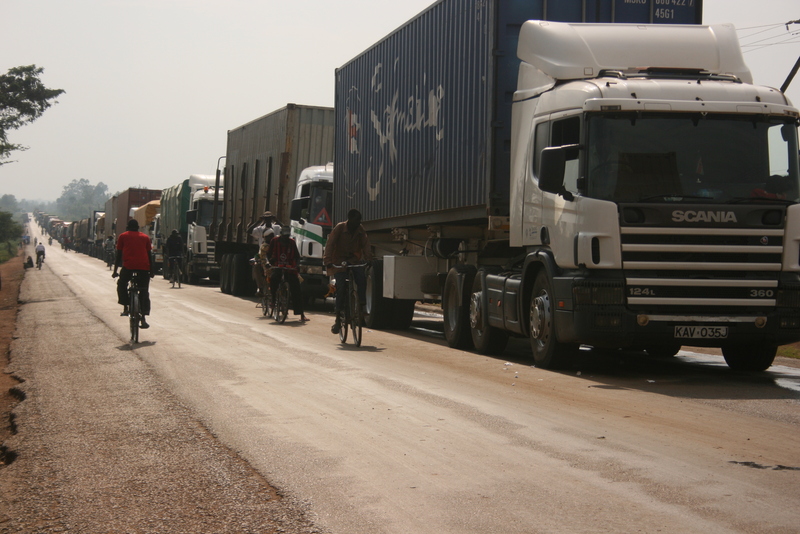 Lack of adequate road, rail, and other physical infrastructure continue to impede trade within and between African countries. 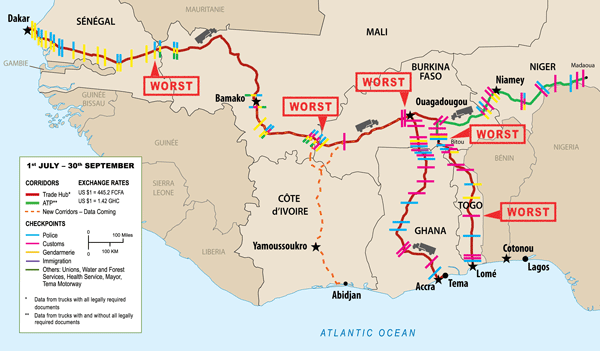 According to a report from the UN Economic Commission for Africa, only about 30% of African roads are paved and, as a result of this “shipping a car from Japan to Abijan costs $1500 while shipping that same car from Addis Ababa to Abijan would cost $5000.” Some of these unpaved roads have potholes big enough to swallow an SUV. The railways in Kenya and Uganda face multiple constraints, including ageing equipment and infrastructure with some over a century old. These are just some examples of red tape and trade barriers that are costing Africa billions of dollars and depriving the region of new sources of economic growth. However, in spite of all this, there is reason to be optimistic. It seems that for the past few years, this issue has become too dire to ignore and strides are being made to rectify it. Also at the 2014 World Economic forum, Africa’s richest man, Aliko Dangote spoke on the matter of visa issuance stating that presently, he and other Nigerian businessmen are required to obtain visas to enter about 38 African countries but a foreigner has more access to these same counties than he does because all they need to do is get a visa at the airport and pass through.Steps are being taken to streamline the visa process so that African businessmen and investors can invest in other countries with ease. In Kenya, barriers that formerly prevented professionals like doctors and lawyers from practicing in Rwanda have been removed. Now, a Kenyan lawyer can practice law in Rwanda without sitting for the bar all over again. This will also lead to a reduction in unemployment because new graduates will have more job options and not so new graduates will have more opportunities to provide services. At the end of the day, increased inter Africa trade is the best way for Africa to use all of its resources and talent become self sustainable, grow and thrive. The less cumbersome the trade process is, the lower the cost of goods and services will be. The lower the cost of goods and services, the more people can afford them. The more people can afford them, the more people will be empowered and gradually lift themselves out of poverty. Part 2 from Tony of what Africa needs. If you can develop a system/app/ method that can make crossing borders with people or goods easier, then Africa needs you.